Sam Patch swung his hat and leapt off the cliff, cutting through the mist towards the seething whirlpool below. A roar rose up from the massive crowd of over 8,000 people. The outcome of this feat – at High Falls in upstate New York – would send reverberations across the nation. Sam Patch's jumping career began several decades earlier at Slater Mill in Pawtucket. From the age of seven, Patch worked in the mill, scuttling between looms, clearing bobbins of cotton, and replacing them with empty ones. Eventually, he was promoted to a coveted weaving position. He toiled for fourteen hours a day, six days a week, starting at five in the morning. 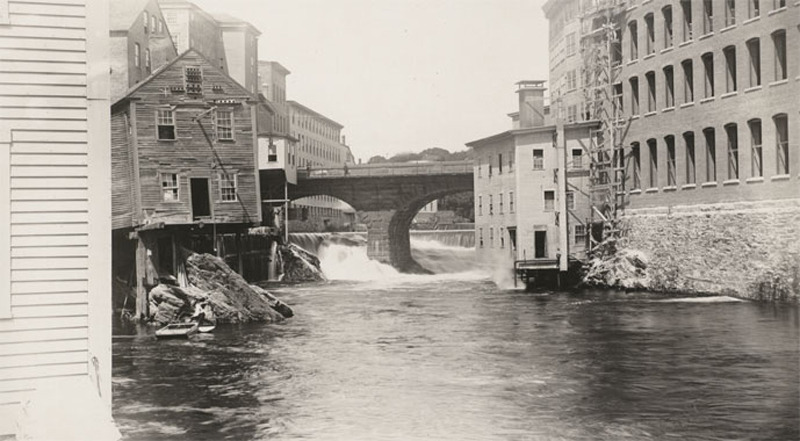 In the summer the mill was hot and humid, and during lunch breaks Patch would join other boys in jumping off the mill dam or nearby bridges into the cool tidal pool at the foot of the Pawtucket Falls. Soon this leisurely activity turned into a competition, with each boy jumping from higher and higher-still factory windows. In 1824, mill owners demanded that workers accept steep wage cuts and a shortened lunch break. Patch, along with his fellow workers, protested against these unfair practices. Continuing conflict with mill management may have been one factor that precipitated Patch's subsequent move to Paterson, New Jersey, where he found work at another mill. Upon hearing that a bridge was to be built over the Passaic Falls, Patch declared that – once built – he would jump from it. On September 30, 1827, he jumped as promised from Clinton Bridge, drawing a large, incredulous crowd. The press went wild, dubbing him the “New Jersey Jumper” and launching his career as a daredevil stuntman. Patch's career hit a high point in October of 1829, when, as part of his east coast “Jumping Tour” he became the first person to survive a trip over Niagara Falls. Waving to crowds assembled on both the American and Canadian sides of the Niagara River, he kissed the American flag before hurling himself one hundred and thirty feet down into the churning river. One month later, Patch found himself poised above High Falls in upstate New York. However, this leap went terribly wrong. Patch's body dropped like an arrow, when suddenly his legs separated and set his body spinning. As he struck the water, a terrible thwack echoed through the air. Audience members held their breath – one minute – two minutes – three minutes – but there was no sign of the daredevil. Rumors rippled through the crowd: could he be hiding in a cave at the base of the falls, poised for a triumphant reappearance? It took four months to find his corpse, frozen in a block of ice six miles downstream. Sam Patch lived on in the American imagination as hero to a budding proletariat culture: democratic, hard-drinking, sports-obsessed, and loving of melodrama. Amidst a rapidly changing social structure, Patch's trademark phrase – "Some things can be done as well as others” – hinted at what we now call the American dream: a belief that human ingenuity can generate endless, perhaps even extravagant, possibilities. Pawtucket Falls: The Pawtucket Falls, as shown in this early-twentieth-century postcard view, sparked Sam Patch's jumping career. Originally, Patch was one of many child laborers who jumped into the base of Pawtucket Falls for leisure. Unlike other children, however, Patch reveled in the adrenaline and attention of taking more spectacular leaps. Propping a ladder against surrounding factory buildings, he jumped from higher and higher heights, draw­ing large crowds. 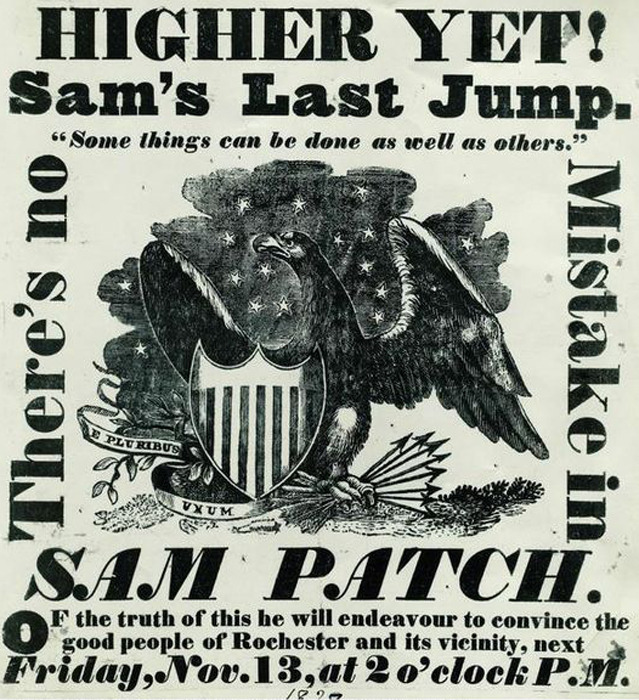 High Falls Advertisement: Despite his performing with a trained circus bear, Sam Patch's first leap into the Genesee River in Rochester, New York, had lackluster attendance. 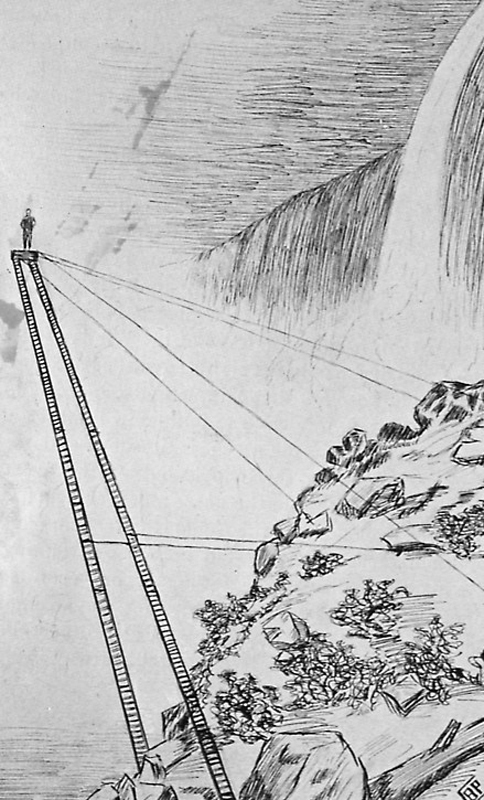 Persistent, Patch increased the height of his jump by constructing a twenty-five-foot stand and widely advertised a follow-up stunt. The advertising campaign was successful. Though it proved to be fatal, his jump on November 13, 1829 drew a crowd of nearly 8,000 people. 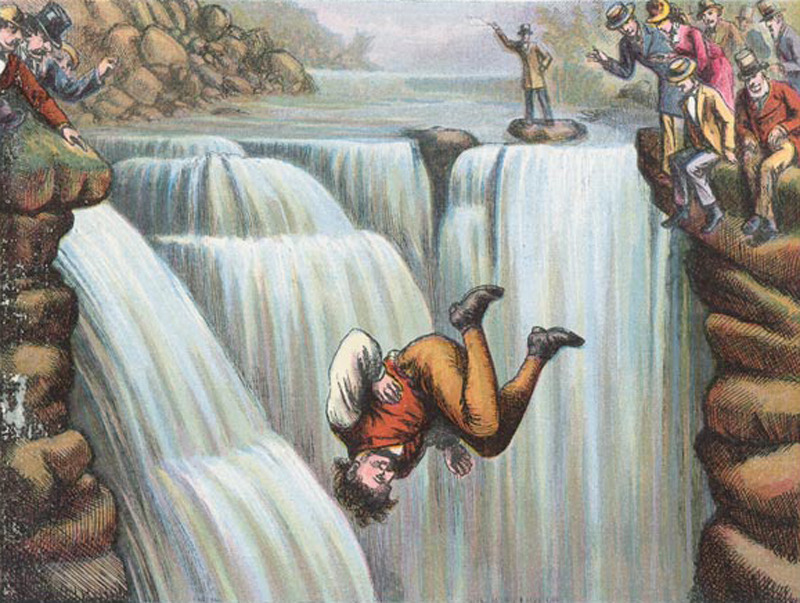 Sam Patch falling head-first at High Falls: When Sam Patch jumped over High Falls in Rochester, New York on November 13, 1829, something went terribly wrong. He usually dove straight as an arrow; this time, his body somersaulted erratically, hitting the water at a deadly angle. A known drunk, some suggest that liquor may have been to blame. ~ Source: The Wonderful Leaps of Sam Patch. New York: McLoughlin Brothers, 1875. 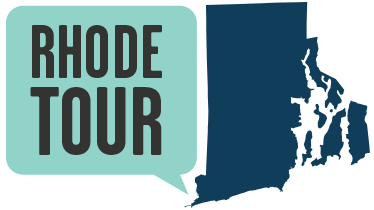 Molly Kerker, “Pawtucket’s Daredevil,” Rhode Tour, accessed April 22, 2019, http://rhodetour.org/items/show/35. “Life and Death of Sam Patch.” United States Magazine. December 1856: 567. Rotella, Mark. “Sam Patch, the Famous Jumper.” Publishers Weekly 250.19 (May 12, 2003): 58. “Sam Patch Is Recalled: A Famous Old-Time Jumper Whose Story Few People Know.” Washington Post. June 27, 1915. “Sam Patch's Last Jump.” Ohio Farmer 22.5 (February 1, 1873): 78.